Best Kamado Grill: Kamado Joe vs Big Green Egg vs Primo and More! Turn your backyard BBQ game up a notch and explore new cooking techniques with a Kamado gril. Discover why even the most experienced grillers swear they’re the best outdoor residential cooking option. Kamado grills are charcoal-fueled modern versions of the Chinese and Indian clay, earthenware ovens and urns dating back thousands of years. Most modern kamados are made of thick ceramic shells, but some consist of cast iron and other metals. These materials give kamado grills excellent insulation, allowing them to absorb and radiate heat evenly to hold steady temperatures. They’re excellent at both grilling and smoking because they can maintain very high or very low temperatures. Kamados are perfect for cold climates if you want to cook outdoors all winter. The Kamado Joe Classic II wins our top spot as the best kamado grill on the market. Kamado Joe has been manufacturing premium ceramic grills since 2008, and this model is a winner at a competitive price. The Classic II includes features that beat out the Big Green Egg, the industry-leading kamano smoker for decades. Its “Divide and Conquer” cooking system gives you two-zone cooking, with a half rack on two levels so you can get one-half of the grill down lower to the coals. Other standout features include a patented slide-out ash drawer for easy cleaning, a multi-panel firebox, an air assist lift for the cover and a heavy-duty rolling cast iron cart. The Big Green Egg wins our number two spot as the best kamado grill. Born in 1974, the Big Green Egg remains the most popular brand of kamado in the world, and devoted fans even call themselves “Eggheads”. The build quality of premium ceramic materials and grill performance are top-of-the-line with both the Egg and Kamado Joe. And both have excellent limited lifetime warranties. 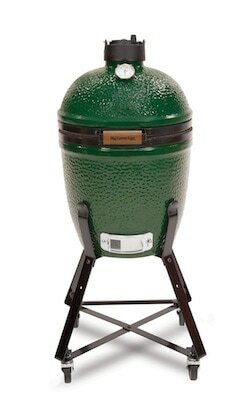 Where the Egg may fall short for some grill masters is fewer features (no handy removable ash tray), the fact that you can’t purchase “the Egg” online, and price. A cart is a must for these grills due to their heavy weight — Kamado Joe comes with a cart, shelving and other handy accessories; the Big Green Egg does not. You have to purchase them separately (available on Amazon), which drives the price up considerably. Large model’s weight: 162 lbs. The Primo 778 Extra-Large Oval Ceramic Charcoal Smoker Grill rounds out our top three kamado grill winners. This high-end grill is geared toward seasoned grillers and smokers. The Primo 778 has a unique oval shape that makes two-zone cooking a breeze. And you can add a dividable firebox making indirect grilling quick and easy. Primo has years of experience crafting their thick ceramic construction, and owners say this grill is built like a tank. Primo also offers a round grill that is a high performer. We’re not done with our kamado grill comparison reviews yet! Be sure to check out the following popular, and, in some cases, more affordable products. Want to wow your fellow tailgaters with a kamado style grilling experience? The Broil King Keg 5000 can do that and more. This charcoal barbecue grill’s major selling point is its portability. Made of lightweight fiberglass encased in powder-coated steel, it’s not as heavy as its ceramic counterparts. It’s trailer hitch compatible for your party on the go. Even though this grill isn’t ceramic, this bad boy does a superb job of maintaining both super high and low temps like other kamados. The Pit Boss 71240 Kamado BBQ Ceramic Grill Cooker is another kamado style grill that’s worth consideration. This grill features a heavy ceramic body, dual-tier, stainless steel cooking grids that give you a generous 660 sq. in. of cooking space and a cast iron top tamper that gives you full control over air flow. It comes with a rolling cart and solid bamboo side shelves that fold down for easy storage. All hardware is stainless steel, so rusting shouldn’t be a problem. Cooking space: up to 660 sq. in. The Vision CF1F1 Pro Kamado bundle is an excellent value if budget is a priority. This kamado has a heavy-duty ceramic exterior body and fire bowl and a patented ProZone in the bottom, which includes an electric starter port for quick lighting, dedicated smoking and grilling knobs and a handy removable ash drawer. You get several accessories included in the price: a two-tiered, stainless-steel flip cooking grate, a rolling cart, two side shelves and a heavy duty UV-protected vinyl cover. Overall, users rave about this grill’s value; however, some complain that its temperature control isn’t up to par and it doesn’t maintain low heat settings well. Cooking space: 606 sq. in. Weber, the popular grill manufacturer, introduced its Summit Charcoal Grill in early 2017, a major upgrade to the Weber Kettle. The design of this kamado-style grill makes it an excellent cooker for both grilling and smoking. It features a two-position charcoal grate that you can raise for improved searing or lower for smoking. And the stainless steel hinged diffuser plate allows for indirect low-temperature cooking. Made of premium-grade U. S. Steel coated with porcelain enamel, the Summit Charcoal grill features a double walled bowl and lid. Air gets trapped between the double walls and acts as an insulator, retaining heat and keeping the temperature consistent. This is a great product, but its price is certainly not budget friendly — especially when you only get a 10-year warranty. Cooking space: 452 sq. in. Our top winner, Kamado Joe, and other kamado grill manufacturers carry a wide variety of accessories to enhance your grilling and smoking experience. Many provide kamado grill recipes in their manuals and on their websites. Check out this video to see what Kamado Joe offers. Do you enjoy other outdoor activities besides grilling? Why not plan a camping excursion? Whether you’re an experienced or novice camper, we’ve got some great info for your next trip. Be sure to check out our camping gear list and reviews of the best tents for camping. Live it up in the great outdoors! What grilling and smoking tips do you have for wannabe grill masters? You obviously have not used any of these grills.